Knowing how to fish and trap meat is a lifesaving skill in wilderness survival, but there are a variety of circumstances that would not allow for one to take the time necessary to hunt or trap. Perhaps you are anticipating bad weather, you are injured, or you know that you are within several days journey of safety and your time and energy would be better spent covering ground. Whatever the case may be, you don’t want to only have a survival plan that requires you to stop what you are doing and devote your day to getting your food, you need to know how to get food on the go to save time and keep you moving. The trees available to you will differ from location to location, but in most areas and in even in the dead of winter, you can get nutritious survival food from trees. Birch, aspen, cottonwood, pine, and spruce all have edible inner bark. To harvest the bark, remove a small limb, using the back of your knife or a sharp stone scrape away the outer bark without going all the way to the wood. Then shave off the inner bark and cut it into pieces to make chewing easier. Rock Tripe is a name for a lichen that is commonly used as wilderness survival food. In my research, I have only found mention of one poisonous moss or lichen and it grows above the arctic circle. According to an Air Force survival manual, all moss and lichen below the arctic circle are edible. Normally rock tripe is boiled, but if you are trying to eat and move they could be consumed raw. While fiddle heads are not available in the winter they are a great source of survival food. 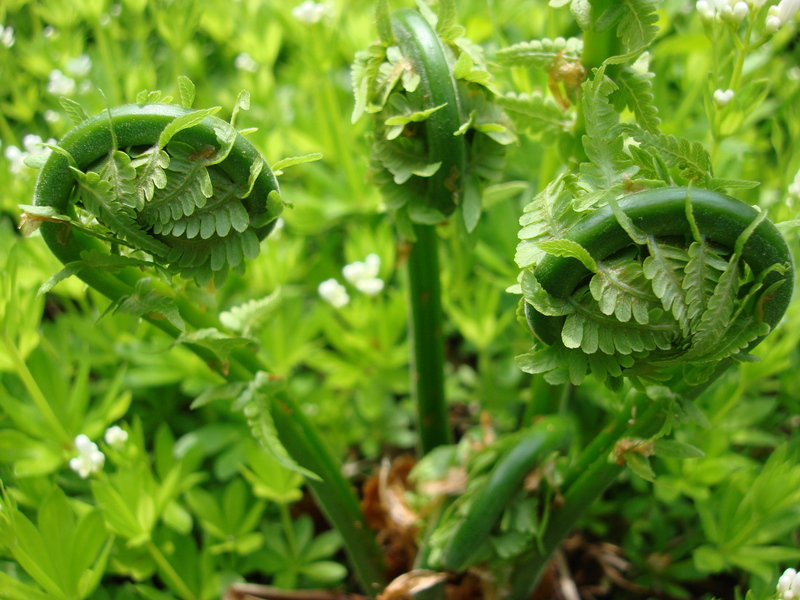 Fiddle heads are the unopened new growth on ferns. They will have little hairs on them that you do not want to eat, and there are species that should only be eaten after being boiled so only eat them raw if you know that the ferns you have are fine to eat raw. Don’t think of feeding yourself in the wilderness as something that takes all day, if you know what to look for you can get the fuel you need on the go, to keep going.